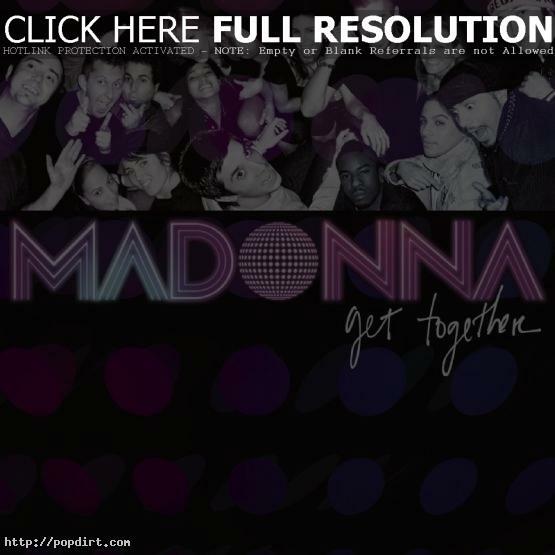 Contributed Anonymously: Madonna.com confirmed that the third single to be taken from Madonna’s ‘Confessions On A Dance Floor’ album is ‘Get Together’. The official release date for this new single is to be announced very soon. The maxi-single will includes remixes by Jacques Lu Cont, Danny Howells, Tiefschwarz and James Holden. Madonna To Implement Parkour During Tour? Another flop for the hag. And she pretends to sell by only doing some cities and making homos travel from all over the U.S. and Canada. The old hag will also waste millions buying a huge ball and doing street moves…..pathetic. Flop Together’, ‘Incidentally, the third single from my hit CD, “Confessions on a Bargain Bin” has been released too. It’s called “Flop Together”. Here’s the lyrics: There’s so much flop-fusion It’s not an illusion There’s so much flop-fusion Down, down, down are my songs Turn, turn, turn back time around Maybe I can do it if I didn’t wear tights. Do you believe in the World Wide Charts? It’s an illusion. There’s just R’-AA Do you believe that I will be noticed? Too much illusion, Wake up, homosexuals. Can we flop together? I really, I really wanna make it big. Come on, buy my CDs, gays. I hope you buy my tickets too. Search, search, search everywhere Find, find, find my songs flopped Coz all I did was fail in all things Homos, I can’t do it but Mariah C won. Do you believe that you can change my failures? Do you believe everything will soon be better? Can we flop together? I really, I really wanna make it big. Come on, buy my CDs, gays. I hope you buy my tickets too. Mooriah’s fans are upset at the success Madonna is having. They can’t take the fact that both mariah’s new singles are flopping. It’s back to the loony bin for her. I’m very disappointed at ‘Get Together’…It will surely flop in the U.S. but not’, ‘Globally where it would extend her 22 week reign at #1! Another huge #1 smash for the best selling female artist ever. The song is better then Jump, that one is also great though. It’s awesome to see M releasing the songs she wants to and is not letting the current fad on American radio dictate what kind of music she will be putting out like so many other artists. She did what she wanted to and got the biggest hit single of all-time (Hung Up) which was #1 in more countries then any other song in the history of music. The poor Corpse. The album was such a flop, that instead of releasing 5 singles as originally planned, this 3rd one will be the last song released from “Confessions of an Old Hag”. I am confused also. Jump is such a better choice, but isn’t it suppose to appear in’, ‘a Nike commercial? Maybe Warners feels it would increase sales to use one song in a commercial & issue another to radio. Hooked, I’m glad you posted this. Everytime I make a comment about Mariah selling her’, ‘singles @ a discount I hear all singles are sold for that amount……not in the 90’s they weren’t and the 90’s are when Mariah had most of her #1’s. It’s hard for some people to get the fact that when other artists were selling singles for $2 + and Maxi’s for $4+ Mariah was selling hers for $.99 ! Mariah Careys catalog is very misleading….dishonest to be exact. And while her fans call Madonna a greedy B*tch, Mariah keeps releasing he same album as deluxe & platinum editions & all her fans run out to purchase the album AGAIN! If she so loved her fans & was all for her fans, why not release the “Platinum Edition” as the album itself? WHY.. CAUSE SHE IS JUST AS GREEDY HERSELF but does it with a smile in a tacky outfit! Atleast with Madonna YOU GET YOU $$$ WORTH. Thanks again Hooked. Mooriah has shelved plans for her first ever tour (no one has ever wanted to her live) because, as always, she is a flop. Mooriah has never had a successful tour in her whole career because she cant even sing/perform live. The last time she tried to tour it had to be cancelled because she couldn’t even fill town halls!